35 Open Houses – Comparison of Open Lists on Realtor.com, Zillow, Trulia, GreenwichStreets.com and others. You can find the Interactive open house map here. People are still better than computers when it comes to putting together a list of all the open houses in Greenwich. 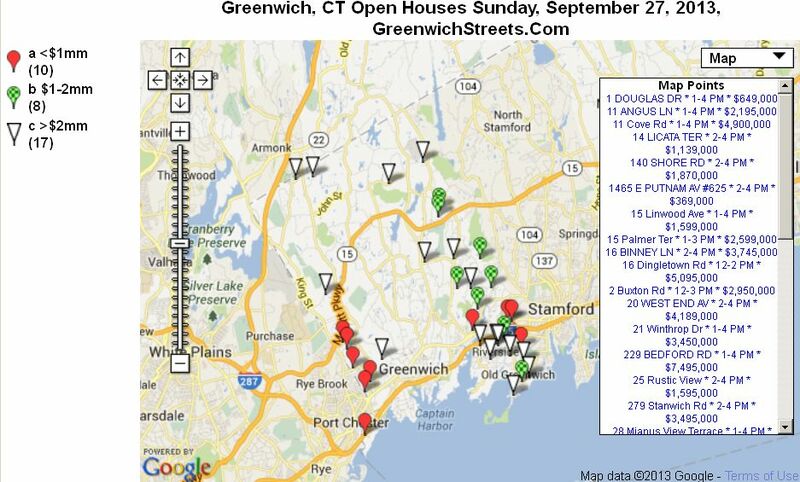 Each week Rob Pulitano searches a variety of places to find all the open houses in Greenwich on any given Sunday. The results for this Sunday are above. The list Rob put together has 35 open houses, 9 more than are listed in the Greenwich MLS and appear on the map below from GMLS available only to Realtors. Some agents will put a full page ad in the Greenwich Time and forget to put the open house listing in the Greenwich MLS which means it won’t appear on Realtor.com. Even if they don’t get some of the listing Realtor.com still does better than other computer prepared listings for number of open house listings. You might expect it to have the same number of listings as the GMLS since as the official National Association of Realtor’s website all MLS listings can be automatically fed to Realtor.com. In fact, however, many aren’t, since the listing agent doesn’t check the IDX feed box on the listing input form or doesn’t check the show address box on the form. Now you might think that agents were withholding addresses to protect the homeowners privacy, particularly, with high end houses. Too often though the same house is dually listed on the Greater Fairfield County MLS but their the address is displayed. It’s simply that the GMLS default is not to display the address on the Internet while the CMLS default is to display the address. As a result Realtor.com has multiple duplicate open houses some with and some without addresses. Realtor.com also has a variety of GMLS only listing that show up on the open house list as “Address Not Available”. So you know the time for the open house just not where to go. Realtor.com lists 36 open houses in Greenwich this Sunday, but they have by far the most duplicates and no addresses so a user will find only 21 usable open house listings. Realtor.com does have a very handy feature at the top of their open house map; a series of boxes that let you refine the search. Of the other two major sites, Zillow and Trulia, Zillow lists about half of the actual open houses and Trulia less than one-third of the open houses that we have today in Greenwich. Zillow, however, has the worst feature among all sites which is their prominently displayed “Zestimate”. Take a look at the first listing above for 44 Glenville Road, listed for $4.45MM with a Zestimate of $3.83MM. It’s low, but not outrageous like the second property at 20 West End Avenue. This house is listed for $4,189,000, but the Zestimate is $1.9MM. Clearly, it’s way off, but some people actually believe it. We had a Zillow representative make a presentation to the Berkshire Hathaway office and said that the awful estimates are useful tool for opening a dialogue with the customer. The problem is that people see the estimate and never even bother to call an agent, because they believe the Zestimate is right and don’t even call to find out how bad it is. All of these sites only have a few of the listings. Amazing that a site targeted to open houses such as OpenHouses.com doesn’t have many open houses, at least here in Greenwich. If you know someone that wants to get the complete list of open houses every week, send us their email addresses and we will put them on the mailing list. The fall market is doing better than normal with listing up and high end sales really starting to take off. Maggie Gordon at the Greenwich Time writes an excellent article entitled Fall Real Estate Market Preview. She took a tour of some of the great homes out their including 297 Round Hill Road. The front page article included a photo of this house and the online article includes some excellent photos of the house taken by GT photographer Helen Neafsey. 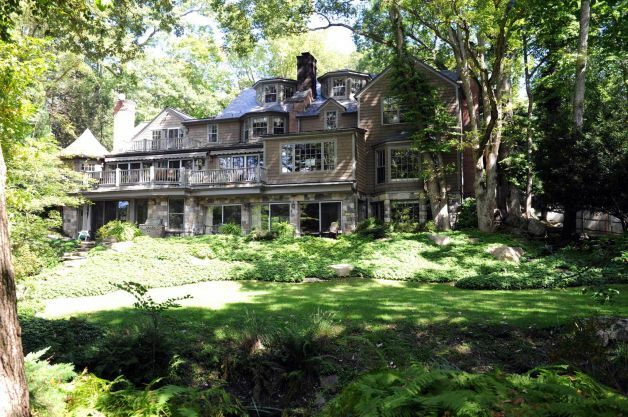 The first home, a 9,000-square-foot stone-and-shingle manor house at 297 Round Hill Road, is on the market for just under $5 million. It sits on 2 acres in midcountry and has its own private island carved out by streams in flowing into a shared pond. “It’s a great house. It’s in the part of the market that is really starting to turn up here in the last few months,” said Pruner, who is representing the house. With the fall coming on and the leaves changing this house and others are going to be set off beautifully by nature’s amazing show of fall color. The fall market is in full swing and the market is hot under $2 million and getting tighter over $3 million. Check out the open house list below and the August market report below that. 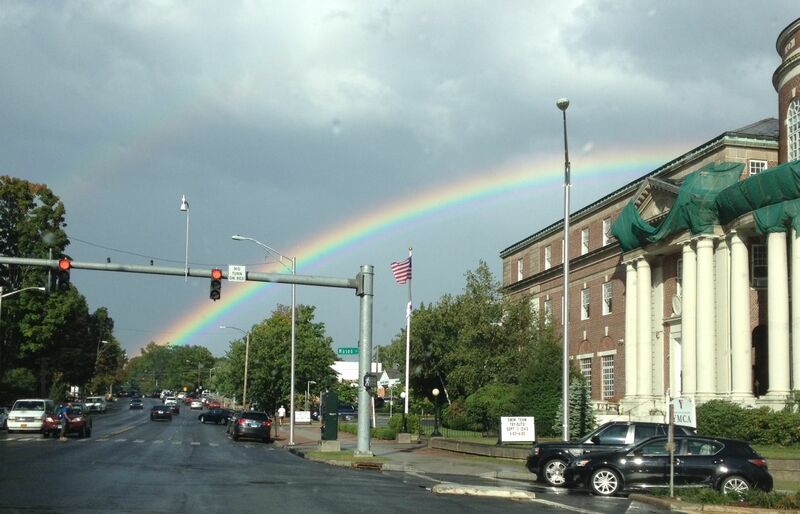 For folks that were around Friday afternoon you got to see one of the most beautiful double rainbows I’ve ever seen and I’ve been here since 1967. Photos don’t do rainbows justice, it was gorgeous. Should be a great day to get out and see some open houses. I’ll be out showing some open houses so feel free to say hi. You can see the interactive map here. August 2013 has been another very good month for real estate sales in Greenwich. The Greenwich MLS reported 76 sales of single family home and another 93 houses that are under contract or with accepted offers. The result is a dramatic drop of 61 listings or 12% in one month. Traditionally, inventory drops in August as new listings are held off the market in August waiting for the post-Labor Day fall market. Months of Supply couldn’t really go much lower in September. Below $1 million we only have 3 – 4 months of supply with an amazing 2.9 months of supply below $600,000. What we did see in August 2013 was a tightening market from $2 million to $10 million. The most dramatic segment was from $5 – 7.5 million where months of supply fell from 27.3 months to 19.8 months of supply or a drop 7.5 months based on 4 sales in August (see Months of Supply charts below). We also have 6 contracts pending in this price category. The fall market has been gangbusters so far as we have 56 new home listings, replacing in six business days nearly the entire inventory reduction in August. New inventory in the high end has been particularly dramatic as we have 20 new listings for over $5 million. At the other, and very hot end, of the market we only have seven new listings under $1 million. The Greenwich real estate market continues to be a tale of three markets hot, warm and cool as you go up in price. The hot part of the market is getting bigger and moving up in price range. In the early part of the year the hot market only went up to $1 million, by the second quarter it extended up to $1.5 million and now in August the hot part of the market has extended another $1.5 million to $3 million. You can see this particularly in the $2 – 3 million price range where we are at 6.8 months of supply down from 7.6 months in July. If you look at the months of supply chart below for the $2 -3 million price range you can see that sales (blue bar) are around six month supply; the dividing line between a buyer’s and seller’s market. When you add in the 19 pending contracts months of supply are about the same (red bar) indicating that this price range will continue busy over the coming month as these contract mature into sales. The interesting bar is the white bar which shows what months of supply would be if August sales were annualized. The result when you annualize the eighteen house sales in August sales is a drop 4.5 months of supply. Any time the white bar is noticeably shorter than the blue sales bar you know that the most recent month was a strong month for sales. The warm part of the market is getting better and also taking in a higher part of the market. As you move up in the price the number of buyers shrinks significantly. As a result higher end houses have always tended to stay on the market longer due to fewer buyers who can afford these houses. The nice thing is that we saw 74 sales between $3 and 7.5 million in August and this is in addition to the 63 sales we saw in July. Once again if you take a look at the white bars in the months of supply chart you can see how much better the $3 – 4 million range did as well as the $5 – 7.5 million range. If sales in the $3 – 4 million range keep up then this category might be headed for hotness. The one anomaly here is that there are no sales between $4 and 5 million in August. This is more an artifact of how I’ve arranged the price bands with there only being 37 listings in this price range compared with 83 and 57 listings immediately above and below this price range. $7.5 Million and Higher – Cool but Getting a Little Better? The ultra- high end market has been cool all year and continues that way. We did have 12 Meadowcroft Lane sell for $9.85 million after 576 days on market. Also 8 Dempsey Lane which had been on for $7.99 sold for $7.375 million, but that was it for the ultra high end in August. The good news is that we have 8 contracts or offers pending for houses listed over $10 million up from 5 contracts in August, so expect a dramatic drop in months of supply in this price range. This shouldn’t be hard since based on the one sale over $10 million so far in 2013 we have a 10 year supply of houses over $10 million houses in Greenwich. As a result one additional sale will bring it down to “only” a five year supply. Months of Supply analysis gives you good feel of the competitiveness of each price range and who has the market power. What it doesn’t show is just how many choice you have in each price range. For example in Greenwich we have 24 homes priced between $600,000 and $800,000 dollars including a listing I just put on at 1 Ferris Drive in Old Greenwich. If that’s your price range and you want to live in OG you only have four choices and if you want to live in Riverside you only have two choices. The blue bars in the chart below show the inventory in Greenwich for home as of August 31st, The good news is that we have 56 more listings since that time. The purple bars show how many sales have been completed so far this year in that price range. Another way to look at competition for houses is to compare the height of the blue bar (inventory) to the height of the purple bar (YTD sales). If there are at lot more sales than inventory you need to come prepared and good broker is critical. The Greenwich real estate market is getting better. Sales are up 20% over last year at this time. Also the hot part of the market is moving up to higher price ranges. We still have the nagging problem that the top half of our inventory, that portion above $3 million represents less than 20% of sales to date. If you look at the light blue pie slice in each chart above representing the $3 – 4 million price range you can see it goes to about six o’clock in the first chart inventory. The size of the slice indicates it represents about 18% of inventory. If you look at the second chart, year to date sales through the end of August, you see that the light blue slice is much smaller and rotated around to ten o’clock. The size is smaller also representing only 8% of sales so far. You see about the same position in chart 3 August sales, but the pie size is 50% bigger at 12% of all August sales. So this is upper end segment that is doing the best.